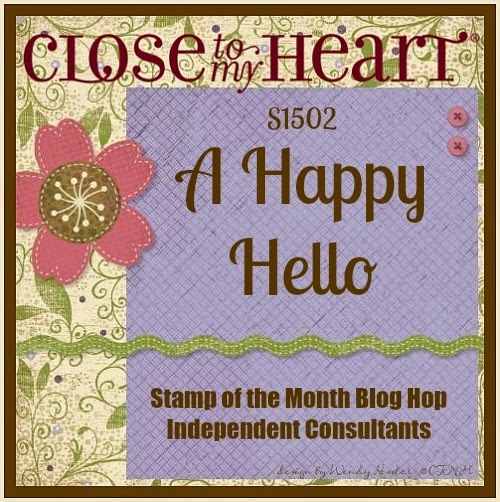 We are featuring the stamp set, A Happy Hello, a set of 15 stamps which is great for making cards or scrapbook pages. If you have come from the wonderfully talented Scraptabulous Dana Kessler, you are on the correct path. The hop is a big circle, so you can start here and hop around the circle. This is simple to do, just click the link at the end of each blog post to move on to the next one. For this hop, I have created a set of cards using various stamps from this set on each card. 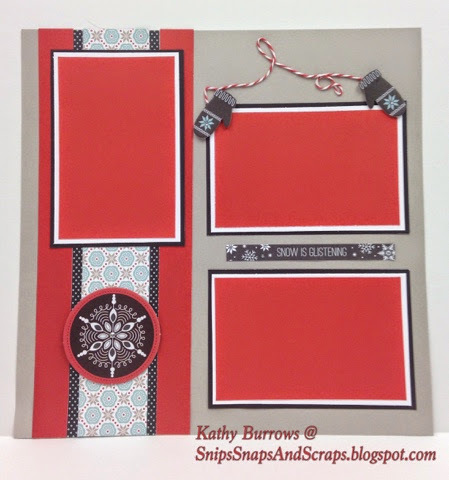 I have to thank another very talented consultant, Wendy Coffman, for the inspiration for these cards. I saw a card she submitted to a card challenge last week and it helped me get past the creative block I was having. So thanks for sharing, Wendy! On the Topiary/Pear card, the bling is from the Brown/Tan Assortment of Sparkles and the greeting is from CTMH Have a Happy Day. The Outdoor Denim/Crystal Blue card, the bling was made by coloring CTMH Silver Sequins with a ShinHan Touch Twin Marker, Cerulean Blue Light. As you can see, on the Cocoa/Canary card, I was able to bend the branch stamp to the shape I wanted. Cool, huh? You may also notice that I used only a part of the greeting. That's another one of things I love about our stamps, you can cut them apart and use only the part you want. But the best part, is you can put the two parts back on the block and use them again as they were made with no trace of the cut mark. As for embellishments, the little bird on the branch is a Junebug Puffie and the gems are from the Bling Gems Gold Assortment. 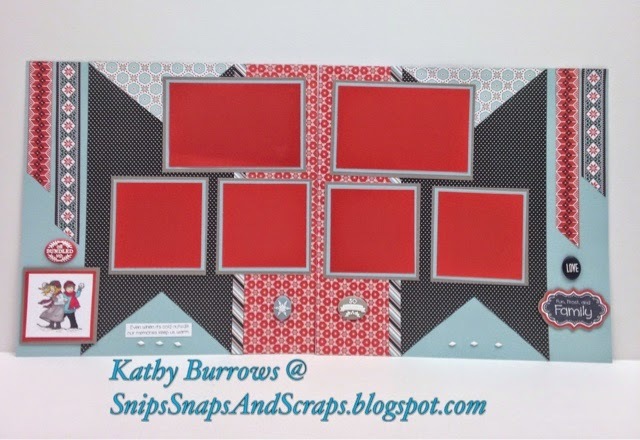 The star embellishments on the Ruby/Cotton Candy card are from the Scaredy Cat Assortment. Just for you comes from the November stamp of the Month - It's The Little Things. Here are a few more cards that I made using this set. 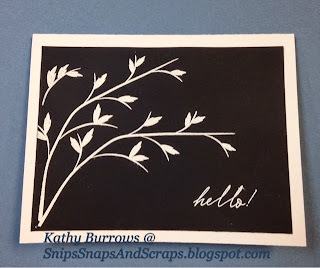 On this card, I used white embossing powder on the black background for a very simple design. On this card I combined the stamp of the month with Doodled Designs and You're the Bomb and a cute little Junebug Puffie. For the solid circles, I flipped one of the circle stamps over and used the back side of the stamp. I also stamped off the thistle ink to create a second generation of color. And of course, the sparkle is the Purple Shimmer Trim. 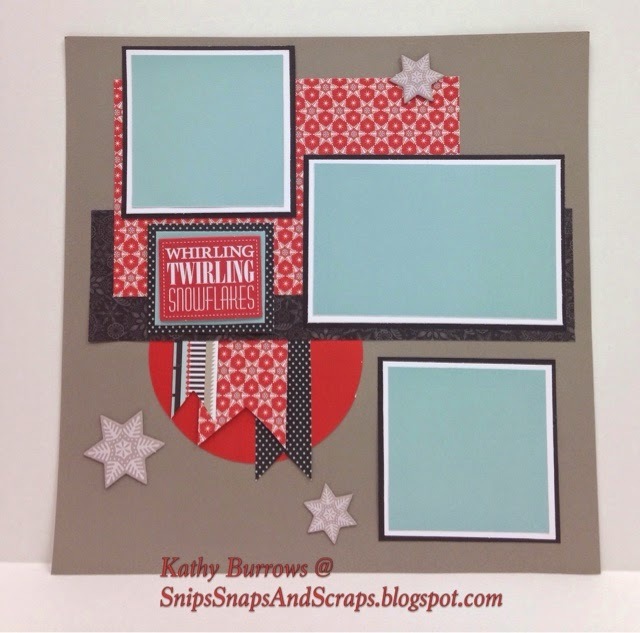 This was a popular card at my last workshop since it is so versatile. You can find this stamp set as well as any of the other supplies listed on my website where you can shop 24/7. Remember this set is only available until February 28th for $17.95, however, you can purchase it for only $5 with a qualifying order of $50. Be sure to visit all the consultant's blogs to see all the great ideas they have come up with. 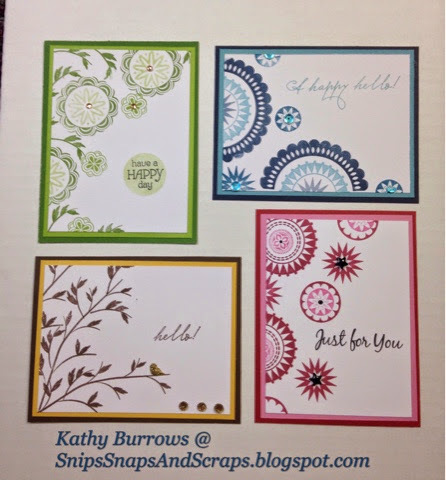 Now hop on over to the very talented Maureen O'Sullivan's blog to see what she has created with this stamp set. Materials for this workshop need to be pre-ordered by January 12. If you are not in the area to attend this workshop, you may contact me to get a complete kit with cutting directions, or a pre-cut kit for a slightly higher price. Embellishments are from the Snowhaven Complements - Warm and Cozy os trimmed a little to fit. 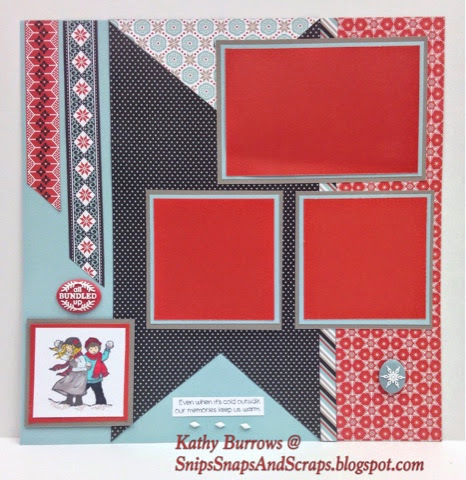 Embellishments are from the Snowhaven Assortment and stamped images are from the stamp set Frosty Fun D1611 and the end zip strips from the paper kit were used on either side of the ruby printed paper. It's a new year and time to get going with all those resolutions to catch up on memory keeping. Why not start with this one? 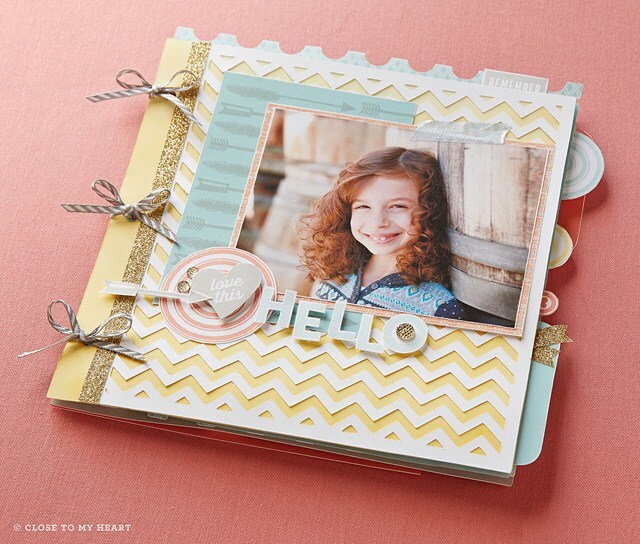 Get the Year & Noted paper kit and start a yearlong scrapbooking adventure! In celebration of National Papercrafting Month, Close To My Heart invites you to reflect on the things that make you who you are and on what you want to accomplish in the coming months. Then, with the help of the Year & Noted paper kit, record your experiences and goals! 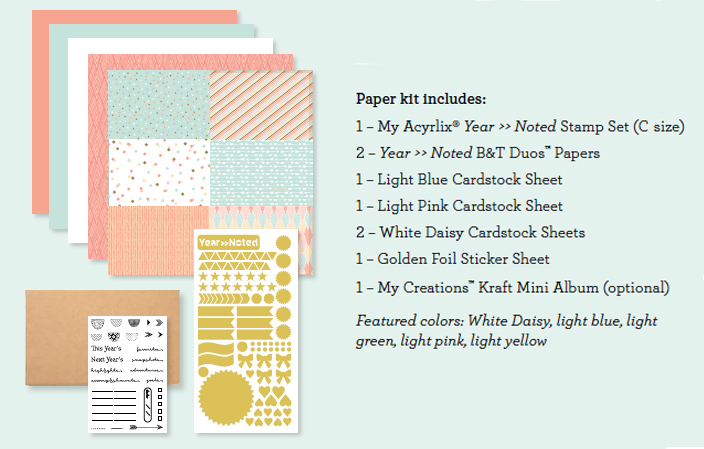 During the month of January, with a qualifying purchase of $50, you are eligible to purchase the exclusive Year & Noted paper kit (which has a retail value of over $24) for only $5—that’s over 80% off retail! 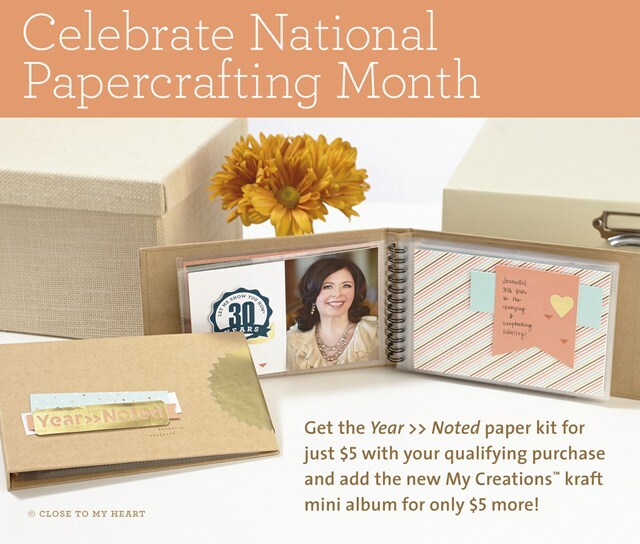 Or, for an additional $5, you can order the Year & Noted paper kit with an accompanying My Creations™ kraft mini book. 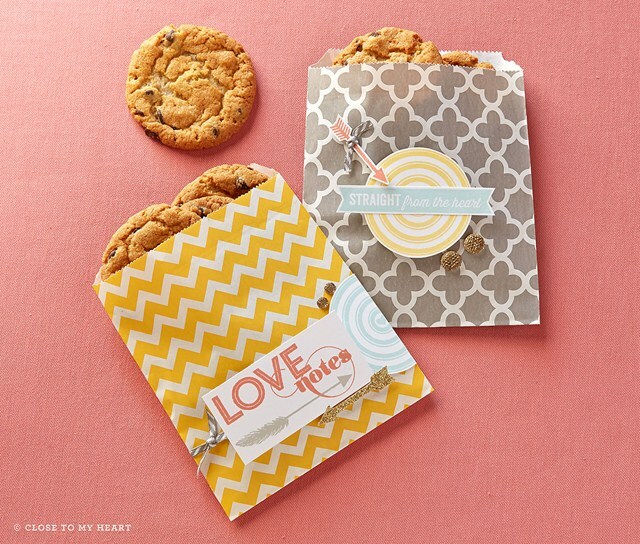 The paper kit for both options includes a C-size stamp set, stickers, cardstocks, and B&T Duos™ papers, all specially designed to coordinate with the My Creations™ kraft mini book so you can have a yearlong scrapbooking experience. This means you will receive over $34 worth of product for only $10 if you purchase the kit with the accompanying mini book! But the fun doesn’t end there—included on the sticker sheet, you will find a large golden seal. Once the year is done and all the pages are filled, seal up your book and create a mini time capsule that you can open years from now. Remember, this deal is only available for January, so make sure to get your own Year & Noted paper kit today for the perfect start to a crafty year! I'm starting mine! Do you want to join me? 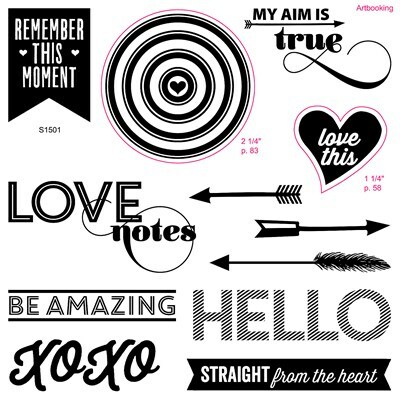 Get this fun filled stamp set for just $5! add it at checkout for the promotional $5 price. 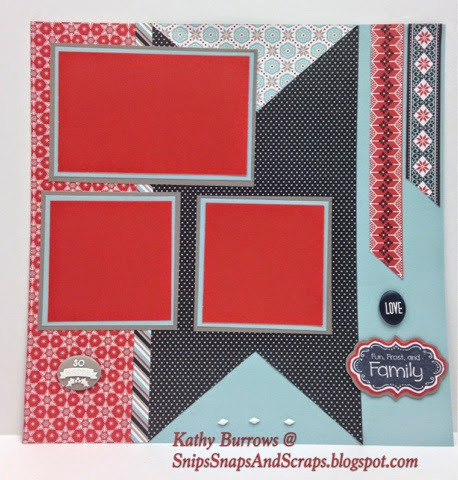 Stamp images outlined in red coordinate with the Cricut® Artbooking Cartridge (Z1906). During the month of January, all Gatherings that reach $350 or higher will be eligible to receive up to 50% more Hostess Rewards! 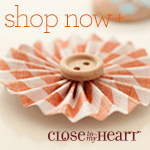 This means an additional $30, giving you the opportunity to earn up to $230 or more in select free products. This offer is only available during January and is the ideal pairing for your National Papercrafting Month Gatherings, so join in the celebration and watch your earnings grow! Contact me to schedule your own home gathering, a workshop with your friends, or host a book party and earn extra rewards this month!